as some of you might know, i've been enrolled as the EB team's liaison (or secretary), and as you might assume my work will basically be to be a link between the fans and the EB developers; one way i'd like to achieve this, is to open this suggestion thread, where fans can give their suggestion on improving the mod. So feel free to give your suggestions in this thread; i'll be happy to read through them and forward them to the team members responsible for that part of the game; while these won't be in the next release, good ones will have a good chance of being implemented in the future, if of course we will have the manpower and time to actually make them work. Unfortunately sometimes an idea can be really good, but it would take too much time for too small results. 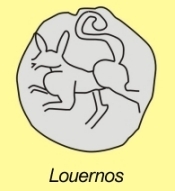 to make a thread for fan suggestions... oh wait..
Luern acronym and logo are inspired by the name of a famous Gallic chieftain called Luernios, who ruled over the Arverne territory during the second century BC and whose symbol (a fox perched on a chariot wheel) is largely represented on coins minted in the main sanctuary of Corent oppidum. - Recruiting more celtic units in Ankyra/Galatia for all the Barbarians (I tried with Getai and Boii, it's pretty a useless town). - In the Georgian mountains, I saw frequently a lot of armies being stuck by the "minor settlement", even if it is empty and on their region. Maybe it's better to move it a bit. Last edited by Genava; May 03, 2015 at 01:09 PM. Maybe it could be something like a general having a "Foreign Engineer" retinue which could unlock a stone thrower or something not necessarily faction specific. I can definitely see smart generals taking advantage of anything at their disposal. I know it wasnt that common in this period but it would be nice if there was a way to make it available to every faction. Maybe when conquering different cultures/capitals which had the stuff. Is this something that has been talked about? Keep adding small details to further add immersion. For example, I always remember watching the first few minutes of a series called 'Rome,' by HBO that depicted the Battle of Alesia. Just before the Roman line was attacked, the Centurion blew a whistle to signal the soldiers to form a shield wall. I think adding little details like that would make battles even better. Here is a link to that scene. Specifically, 1:15. Anyway, I can't say to its historical accuracy but just an idea. Bring back the "health buildings" like the aqueducts for the romans and the hellenistic factions or the soap house for the celtic factions. I always liked in eb1 that a diverse building roster for each faction helped to differenciate them and gave more insight about their culture. If more types of buildings like that could be implemented in the new gameplay of eb2, which is very solid btw, I think it would be very cool. My advice? Just simply keep up the swift pace you guys are at with creating new units, like those gorgeous Agema Phalangitai showcased on EB's Twitter page in the most recent update. They're simply phenomenal. That and please consider making the building trees for settlements outside of each faction's homeland and core area just a little bit more flexible with available construction options than the handful of structures that can be built. For instance, you have to get up to a large city just to build a paved road (as opposed to the simple dirt one), whereas paved roads can be constructed for any minor city in a faction's homeland region. Then there is a whole host of other structures that are simply not available. Certainly the homeland regions should be the most developed and offer the most options, but even allied democracies and oligarchies should be able to produce a bit more than the incredibly limited amount of buildings they are currently allowed. Historically speaking this also makes sense, since, for instance, the Romans developed the Mediterranean world far outside of the Italian mainland, constructing amphitheatres (similar to the Coliseum) from Gaul to Syria and triumphal arches all over the place. The Greek "oxybeles" and Roman "scorpion" ballista units that are available are cool, don't get me wrong, but what about the onager? I don't mean the silly overstated siege artillery piece in vanilla RTW, of course, but the actual historical artillery piece described by Roman writers like the historian Ammianus Marcellinus. Last edited by Roma_Victrix; May 03, 2015 at 06:00 PM. I would like to see some unit additions to the getai and hayasdan.Currently I think these two factions suffer the most having few and mediocre units.Some thracians would be very welcome to the getai and some local units to hayasdan also. It would be great if it were worthwhile to blockade enemy ports. Thanks for the suggestions so far, keep em coming! Keep in mind that the mod is still in it's early stages, so for example not having galatian units in galatia, factions having uncomplete rosters is to be expected due to the overall small size of artists working on the mods. *reemerging factions - don't know what's the deal with MTWII here. I guess it's not possible? I don't really remember honestly, but there has to be a reason why this is not in. *Arverni logo - is there any specific reason you would want a new one? Is there something wrong with the old one? *map issues and galatia, i'll look into it, altough galatia is i think explained above. We could add some generic celtic units for the time being. *charlieh - i really think that that's not possible in the engine. IIRC there's also no proof this actually happened. *with the health buildings i guess it's simmilar to the galatia questions, they will be add in in future releases. *about the port blockades, the problem is that the AI was getting a lot of extra money, as it would just go bankrupt every time if not, so blockades didn't help the player. The guys are now working really hard on the AI's, which imo might soon be the best i've ever seen in a tw game; if we can make the AI not go crazy broke, then they could do without the extra money, which would make blockades relevant; but there's a lot of things here to consider. Imagine that the AI doesn't understand it has to build ships, so they just ignore the blockades and go broke again. That would brake gameplay. I am not sure if it is not already in the game (have not played the proper campaign yet as I am playing mostly CBs on EB and wait with campaign for next release) but if not peace with the dead script would be very useful addition. This script which is alredy present in several mods (Bellum Crucis, De Bello Mundi, Fourth Age Total War) resets the diplomatic stances of the eliminated factions to neutral so the old hostilities or aliances does not affect the game anymore. Also I have found a small mistake in the Geography section of the description of Cotinaia province: The highest peak of the province and of the Carpathian mountain chain is not Kriváň but Geralch Peak. Last edited by demagogos nicator; May 05, 2015 at 06:45 AM. Would it be possible to set the difficult level on the strategy map to make the difficulty level correspond to amount of realism instead of purely difficulty or is it hard coded? For instance: normal could be equal to "realistic settings" with diplomacy following the time periods real diplomacy and factions being open to leave treaties and alliances. I'm fairly certain the reason is because re-emergence takes up faction slots. It was either one slot for all, or one each; either way we don't have the slots to spare. Are you going to fix the "all characters dropping dead at 61"? Patron of: Marcus Trajan, Agent Provocateur and jarnomiedema. EBII has 28 factions, with plans to use the remaining two slots for new factions. Last edited by Wulfburk; May 05, 2015 at 12:13 PM. I'm not a specialist, I'm an environmental scientist, but I have a kind of passion for ancient history and the continental celtic civilisation and it is difficult to me to see the historical sources behind this logo. I think it's a reference to Sucellos who use a hammer and sometimes had a bowl in his hand... but this is its Gallo-Roman representation, not a truly native art from the Gauls. It's why I suggested the coin from Luernios, one of the more powerful king of the arverni's history. Last edited by Genava; May 05, 2015 at 02:31 PM. Re-emergence factions as an option i think it only needs a proper working script no faction slots, so i think it will come. ETA: when it's done. Under the Patronage of Veteraan. Proud member of Europa Barbarorum 2 team, developer of EBNOM, developer of EB 1.21, developer of Diadochi Total War, developer of Hegemonia City States and creator of one modpack for Megas Alexandros.